George Zimmerman verdict: "Riot" allegations still overblown. 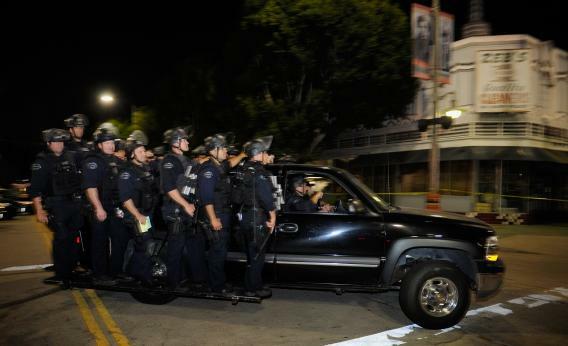 Police officers in riot gear patrol the streets following a prayer vigil for Trayvon Martin on July 16, 2013, in Los Angeles. More than 3,000 people were arrested in LA during the Watts Riots. And Tuesday night? Thirteen people. I’ve written a couple of times this week about the lack of mass race riots following the George Zimmerman verdict. The verdict came down, and was widely known, around 10:30 p.m. Eastern time on Sunday. Protests from coast to coast that night were peaceful. But protests on Sunday and Monday in Oakland led to some violence, and one of last night’s Los Angeles protests was hijacked by a small group of thugs who set about “breaking windows, setting fires and attacking several people.” At the end of the night, a W Hotel claimed $15,000 of damage had been done, and 14 people were arrested. But I’ve tried to be careful with how I describe what is/isn’t happening. As early as April 2012, when Pat Buchanan weighed in on the Martin/Zimmerman case, a big worry on the right was that the politicization of the trial would lead to riots akin to the 1992 LA riots. The LA riots led to multiple beatings, around $1 billion of property damage, and more than 3,000 burned buildings. I hate to minimize the reported beatings that have ensued since Saturday, but they’re not congealing into anything like the fervor that followed the Rodney King verdict. My point’s been that this is a good thing; Hoft, who isn’t alone, has grabbed news of the isolated riots to prove that the existence of any amount of violence proves that there’s a wave rolling and the media isn’t covering it. And the search for proof of Zimmerman Riots has occasionally detoured into farce. On Sunday, for example, Hoft shared the news that “a black mob beat a white citizen journalist in the aftermath of the George Zimmerman verdict last night.” In the original post, which was shared more than 10,000 times on social media, you could watch a video of a man asking a group of black people if they’d “heard about this Zimmerman verdict.” When they started to murmur their opinions, the man suggested that “this stand your ground thing” had gotten Zimmerman off, at which point his interview subjects started punching him. Why am I describing the video? Because it was an obvious fake, now removed from YouTube and from the “Mr. Conservative” site that posted it, and the director/uploader hasn’t answered any questions about it. The thirst for stories of black-on-Hispanic, black-on-white violence is greater than the supply of such stories.